In 2013, the then health secretary Jeremy Hunt announced an ambition that the NHS becomes paperless by 2018. He called for the adoption of paperless referrals and greater use of text messaging services, among other digital advances. Five years on there is still much to do but, encouragingly, many Trusts are adopting new digital approaches. Outpatient services are an obvious place to start: the appointment booking and referrals processes alone present significant opportunities to improve patient experience and release financial savings. reduce ‘did not attend’ (DNA) rates. The main reasons these Trusts joined the Collaborative were to learn from the experience of others, share knowledge and experience, and gain inspiration and ideas from a broader forum. These Trusts approached their transformation projects in different ways but there were common learnings, including the need to engage early and often with information governance teams so that pathways can be designed with ease-of-use at the forefront while remaining compliant. 4% reduction in inappropriate referrals. 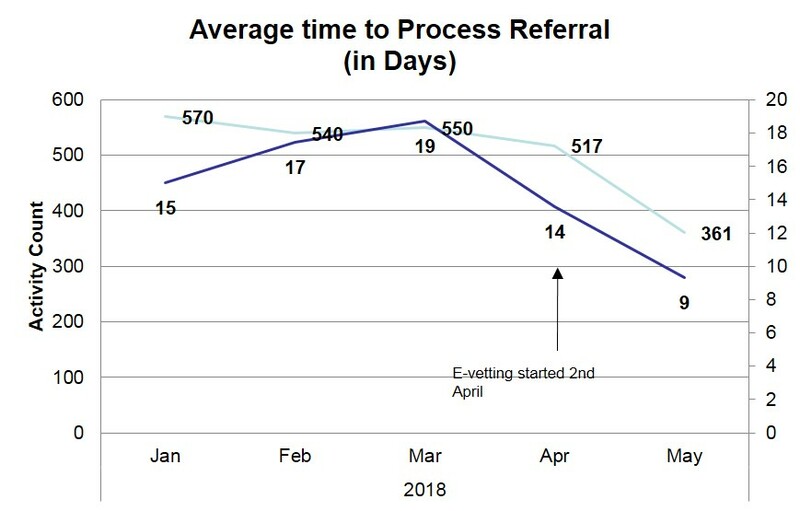 Following the introduction of eVetting, the time taken to process a referral was halved, from 18 days to 9. 40% of patients asked expressed a preference for digital communications. 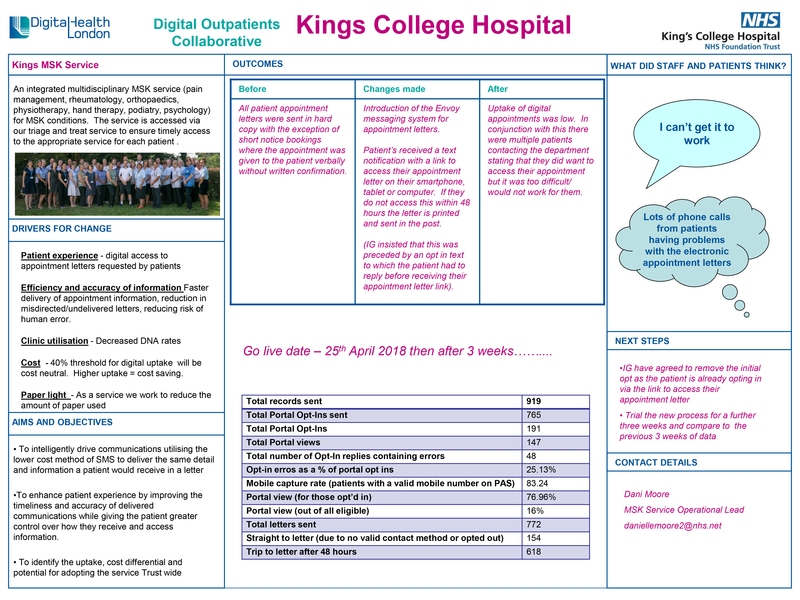 View King’s College Hospital final showcase presentation and poster here. identify uptake, cost differential and potential for adopting the service across the Trust. Before the project started, DNA rates averaged 12.3% in the service over the preceding six months. This impacted significantly on the overall number of appointments available. Appointments could only be booked or confirmed through letters or verbal confirmation. All patient appointment letters were sent in hard copy except for short notice bookings where the appointment was given to the patient verbally without written confirmation. Evaluation considered throughout: data collected during the project included patient uptake of the text message service and patient satisfaction levels. Changes in satisfaction were identified via questionnaires (sampled before and after the messaging process change). New system, the Envoy messaging system (by Healthcare Communications link to website), was introduced for appointment letters. Patients received a text notification with a link to access their appointment letter on their smartphone, tablet or computer. If they do not access this within 48 hours, the letter is printed and sent in the post. 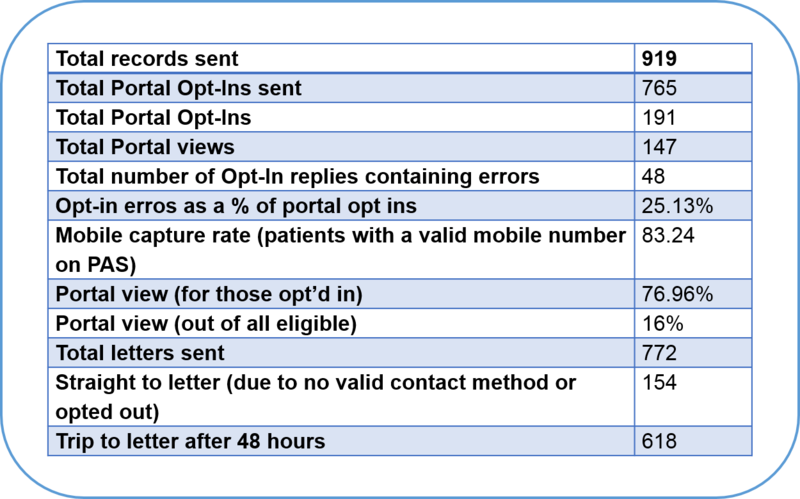 Information governance standards required an opt-in text to which the patient had to reply before receiving the link to their appointment letter. This had some impact on uptake as patients had difficulties accessing the link. Agreement from information governance (IG) to improve the pathway was sought and secured, following patient feedback regarding the opt-in process and its effects on patient uptake rates. A programme that first began in 2016 has really accelerated due to the Collaborative and is now live. to increase availability of referrals at the point of care. Learning from others was crucial and the team found that learning from Imperial College Healthcare NHS Trust, who opening shared their experiences in depth, significantly sped up their project. 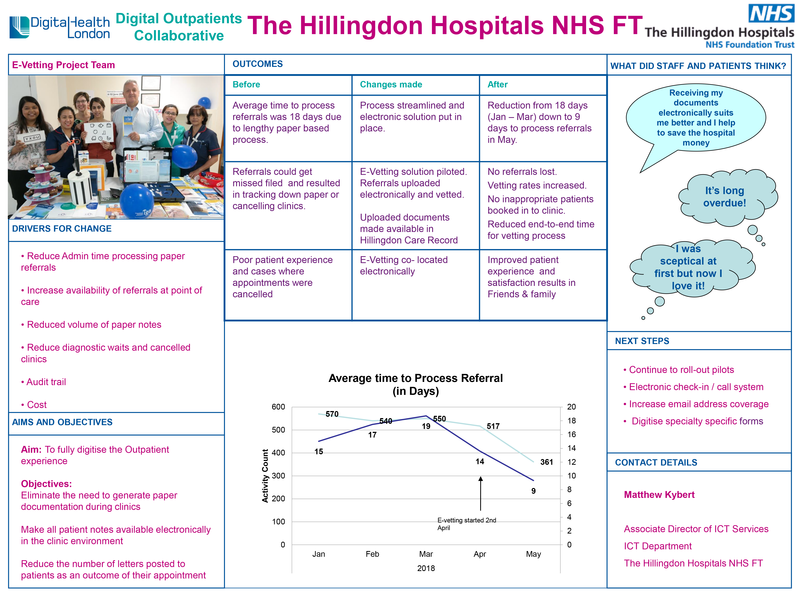 They now plan to roll out eVetting to other specialities within Hillingdon Trust and are ready and willing to share lessons learnt with other Trusts too. Clinical engagement was key and positive, with feedback from clinicians including that they were surprised by how much they liked the new system and wanted to keep using it.